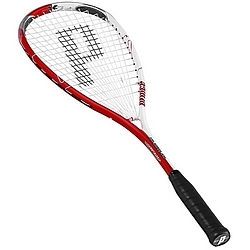 Another Prince Performance Racquet that delivers. At an extra light unstrung weight of 140 grams, Prince has added many of their company exclusive technological advances to make the Air Drive 140 an awesome player stick. Made from Triple Threat with Tungsten and Graphite Extreme, the Air Drive 140 is also constructed with a Power Scoop Shaft, Power Ring stringing bridge, and the newest Prince Air Handle Technology that reduces impact shock by 25 percent. Prestrung with full cover. A unique balanced weighting system that focuses our Triple Threat material in three critical racquet locations. The end result is perfect balance and stability in a racquet that will improve your game. *An expanded sweetspot in all directions. *Ultimate stability for greater power and improved control on all hits. *Less shock, easier on your arm.